Good coverage from Radio NZ on the presentation of the Equality Network‘s Election Statement. It is essential that the issue of reducing inequality remains forefront with an election breathing down our necks. Any inaction on concrete and committed longterm planning to reduce inequalities will continue to have long-reaching impacts for those who live in the harshest of conditions in Aotearoa. It is essential to keep the pressure up. This entry was posted in Uncategorized and tagged Debbie Leyland, Equality Network, Inequalities, Radio NZ. Debbie Leyland spoke on the step of Parliament voicing endorsement of the Election Statement launched by the Equality Network. Attached is the text of Debbie speech. My name is Debbie Leyland. I am 53 years old and I am on a benefit. 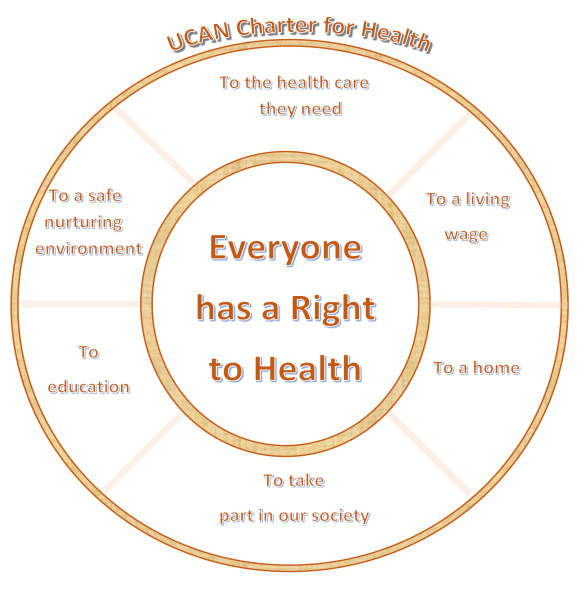 I am also the co-founder, coordinator and spokesperson for UCAN – United Community Action Network, and I am on the steering group of the Equality Network – both of which are voluntary roles. Every week after i pay rent power and bills I am left with $70 a week. The sad thing is, among my friends I’m considered rich. My $70 covers my weekly food, transport, medication and doctor’s fees. It’s really hard. Most weeks I’m also helping out my family – putting $10 into my daughter or son’s account, or buying them a top up card or whatever they need. My daughter has carpal tunnel syndrome which affects her hands so she can’t work. She has an 8-month old baby. Her and her partner are on a benefit, and they are left with just $102 a week after power and rent, to support two adults. and my 8 month old grandchild – $102. for food and everything else including nappies. A few weeks ago my daughter was over here, and I found some money under the bed. I asked her what we should buy as a treat, and we both said peaches! It was like we’d won lotto. Who can afford to buy fruit? No one that I know. I haven’t seen a full fruit bowl, in the house of anyone I know, for years. We bought some cauliflower the other day and we were in heaven, it was like Christmas. I’d love to be able to fill my cupboards with fresh vegetables and food so when my family come I could feed them a really wholesome meal. My fridge is empty. I’ve got a can of baked beans and a can of tomatoes. I haven’t bought a block of cheese for months. It’s too expensive. I’m on the invalid’s benefits because I suffer from Post Traumatic Stress Disorder due to things that happened during my childhood. I suffer from depression and anxiety. It’s very difficult but I’m at a level now where I’m well and I can maintain my life. But sometimes I can’t afford my medication, because I don’t have enough money, and then I become really unwell. I feel like being on a benefit has impacted on my life hugely. The saddest thing for me is the reaction when I’m working out in the community. There’s a lot of people who, when you say you are a beneficiary, think you are either a bludger, or lazy, or whatever. The second part is the financial restraints – it is nearly impossible to live on that amount of money. People frame being on the benefit as a choice. I didn’t wake up and think “I’m going to go on the benefit and live in complete poverty for the rest of my life.” I didn’t ask to be here. Every day I have to make choices. Do I go to the doctor or do I feed the kids? It’s an ongoing battle. I used to go out and about, and now I don’t. The last time I actually went out with my friends was 2 and a half years ago. I can’t do things that people take for granted like going out as a family for dinner, or going out to entertainment. It’s really hard. It was my granddaughter’s birthday the other day, and I just didn’t have enough money to buy her a present or even to go out to Porirua to see her. I just had to ring her and say happy birthday. I’d like to be able to take my daughter or grandchildren for a walk through the town belt but they can’t afford the train fare from Porirua, and i can’t afford to get out there. Being on the benefit really creates distance within families. Being on a benefit and being in a Housing Corp house creates a community of fear. If something happens in my house, nothing ever gets done. After the big earthquake, my bedroom door fell off. They haven’t come to fix that. The toilet upstairs leaks, my windows have mould all over them and I have to wash them every few days. You can’t lock the front door – it’s been like that for about a year. I had my granddaughter over here 2 weeks ago, and she kicked a ball through the window. I rang housing corp and they sent someone over to board up the window. It’s been three weeks and they still haven’t fixed it. But you don’t want to kick up too much fuss because there’s a constant worry that they might throw you out. I hate going to WINZ. There’s nothing more humiliating than having to go to WINZ and ask a complete stranger for money. It’s horrible. When I went to WINZ to get some help with a washing machine, my appointment was at 2 o’clock, but I didn’t get to see my case manager until 3.30. People think that if you are on the benefit your time is not important and you have nothing better to do. What about the people who have to pick up their kids from school? My local WINZ in Kilburnie has moved to Newtown, so if you need assistance or a grant or medicine you have to walk to Newtown. That has affected so many people. We just don’t go now. It’s too far to walk. I’m asking the Government to increase benefits. By increasing the benefit and providing fairer income support it would mean that I could actually partake in society. I could spend more time with my family, I would be able to eat a healthy diet. I could go to the doctor when I need to. I could have some dignity. Getting special or an emergency benefit for example a food grant, as cash would make life so much easier. It would mean I could buy veggies at the Newtown market, cheap Indian grains at places like the Spice Market, and shop around for cheap heaters that I want. Plus, the cards that WINZ gives you are only valid for three days. So in the middle of winter when it’s pouring with rain, you have to walk in the rain to the shops and back with your shopping – all because your card can’t be used on the bus and you don’t have spare money. It’s a real struggle. I think that that’s why the Equality Network is so important, it keeps these issues at the forefront of what is going on. That’s why I’m involved. It gives a voice to people that don’t have any. I want people to realise that beneficiaries are human beings and that decisions made in parliament affect all of us. It’s tragic to think that we’ve gone from Joseph Savage, who set up social welfare so all citizens could have a decent quality of life, to this – where we are living on crumbs, and having to feel grateful. I ask the Government to be brave and act with courage. To support people like myself to have a decent quality of life. This entry was posted in Uncategorized and tagged Debbie Leyland, Equality Network, Inequalities, Living on a benefit, The struggle of trying to live on a benefit, WINZ.